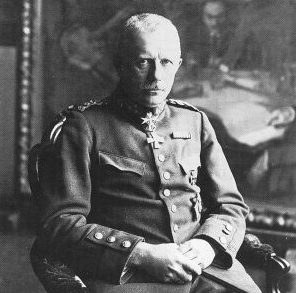 Major General Rüdiger von der Goltz was certainly not a rookie, when on 1 February 1919 he arrived in Liepāja, Latvia. His last command was the Sixth Army, who had fought hard against the Bolsheviks in Finland: Now he slipped into one of the most incredible puzzles formed immediately after the collapse of the German Empire of William II. In fact, on the Baltic there is a geopolitical game in the name of fear of rampant Bolshevism, in which also enter ex-enemies, for example the British, to whom German troops, invited on the Eastern Front, are now comfortable to block the aims of the Bolsheviks, who would like to bring the revolution to Germany or simply recover the territories that Trotzski and Lenin hastily surrendered to Brest-Litovsk, in exchange for peace, to save the revolution. Von der Goltz’s idea conceptually was simple: “In case of success, I hoped to achieve nothing less than the salvation of Germany from the ruin that would be brought to you by Soviet Russia, with civil war and economic and financial collapse, as well as From the hands of the cartel blackers.” According to scholars, von der Golz thought of making the Baltic the basis of the rescue to restore autocracy in Russia and from there, with a white Russian-German army, to return to Germany, to liberate Berlin and restore the Empire. The fact remains that, however, at that time, in Liepāja, port city on the Baltic, has at its disposal an enclave of only 50 square kilometers and just 3850 men, of which a few hundred lateons. On the political level, there is the government of Andrievs Nigra, a pro-German Estonian scholar, who above all represented the interests of the Germanic landlords. Von der Golz would not, however, have stayed with his hands in hand: the offensive he undertook immediately would lead him to occupy Riga on May 23 of 1919, despite the competition, and sometimes the open clash, between three political factions that operated in Latvia against the Bolsheviks: that wire-German note of Nigra (considered for this a traitor after the independence); that of the pro-Western Karlis Ulmanis (whose government would be overthrown by von der Goltz on April 16, 1919), and the pro-Russian and reactionary state of the so-called Western Russia of Pavel Bermondt-Avalov. The German general could still count on veterans, such as the famous unit of the Free Corps (Freikorps) known as the Eiserne Division, on elements of the VIII German Corps, on the Baltische Landeswehr, formed by Baltic Germans and Latvias. The adventure of von der Goltz and the Baltikumers would soon be over, after the signing of the Treaty of Versailles (June 28, 1919), for which on 12 October 1919 the German general would have been deprived of any political-military assignment: Shortly thereafter, at the beginning of 1920, the Baltic Freikorps would have dissolved, thus providing the reviving German nationalism with a sizeable recruitment tank. «With Proud Soul We fought decisively to stop the Bolshevik front, also opposing the orders that came from our government, put under pressure from the cartel. As a military, we have grown under the sign of obedience, but we still believe that our conscience must take precedence over orders when it forces us to spread the boundaries of our homeland from the unnamed tribulations that The bursting of the Bolshevik hordes would impose on our people, and when you call us to cooperate in the liberation of mankind from the fatal consequences of Russian Bolshevism. In our ears still echo the cries of raped women, children torn apart, and in front of ours are still images of corpses bestially massacred. […] Beyond the hatred that World war has provoked among peoples, we propose a great idea that can unite them, for which we want to fight and die, the common struggle for a true worldview of a social nature, the struggle for the defense of this elevated Relig Ideal ion against the deadly poison of Bolshevik degeneration […]. Perhaps there is still a God in the universe who will accompany us1 ». These are themes of European anti-communism that will recur throughout the long-term war and beyond, in Germany, and not only: Paul Siewert, for the record, will die in combat a few weeks later, on November 16, 1919. China from Groelandia to the North Atlantic?